Spark interest in your audience with this eye-catching opening flyer template. Opening a store is an exciting undertaking. Naturally, you want to promote it properly and leave the right impression. This elegant store opening flyer template can be used for any kind of store or business opening, it's just a matter of choosing a theme. 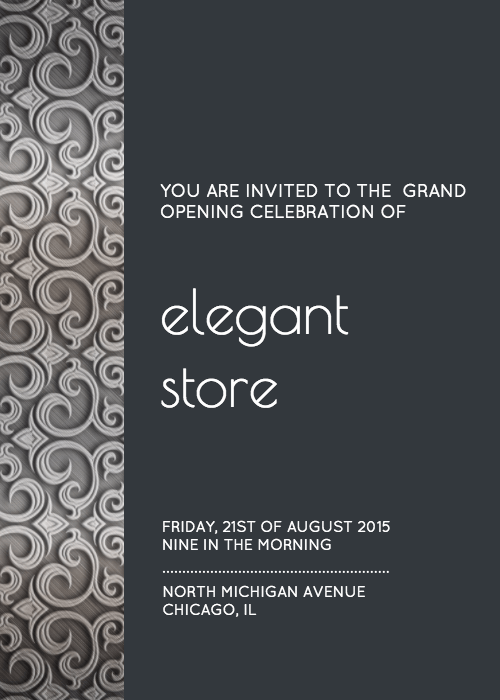 At a glance, this elegant store flyer template sets a tone by using neutral colors, intricate patterns, and thin fonts. If you want to create a mood that is fun, edgy or thematic, you need to combine a particular set of colors, the right fonts and appropriate graphics. Applying the right color palette isn't hard, you can use complementary color schemes, analogous color schemes, monochromatic color schemes and more. Just remember, generally speaking, bright colors are a bit more exciting and fun, warm tones are intimate, cool colors are a bit more refined and sharp contrasts are edgy and cool. But there are exceptions, of course. When choosing fonts, it's a good rule of thumb to only use one unique font that stands out. The rest of the content should use very ordinary, easy-to-read fonts. If you start using too many different fonts, things will look messy. Whereas only using simple fonts might make your flyer look boring. Lastly, including an attractive high-quality image is a great way to grab people's attention. You can upload your own or search through our stock photo library for the one you want. Just make sure it's relevant to whatever your promoting. That's all it takes to whip this template up into a professionally-designed flyer for your store opening! Let us know how you like Venngage's templates. We value the feedback of all our subscribers and love to learn how we can improve our product.